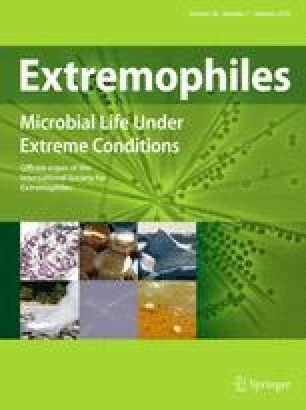 Intracellular and extracellular proteins from halophilic archaea face very saline conditions and must be able to maintain stability and functionality at nearly saturated salt concentrations. Haloarchaeal proteins contain specific adaptations to prevent aggregation and loss of activity in such conditions, but these adaptations usually result in a lack of stability in the absence of salt. Here, we present the characterisation of a secreted α-amylase (AmyH) from the halophilic archaeon Haloarcula hispanica. AmyH was shown to be very halophilic but, unusually for a halophilic protein, it retained activity in the absence of salt. Intrinsic fluorescence measurements and activity assays showed that AmyH was very stable in high-salt buffer and even maintained stability upon the addition of urea. Urea-induced denaturation was only achieved in the absence of NaCl, demonstrating clearly that the stability of the protein was salt-dependent. Sequencing of the amyH gene showed an amino acid composition typical of halophilic proteins and, moreover, the presence of a signal peptide containing diagnostic features characteristic of export via the Twin-arginine translocase (Tat). Analysis of the export of AmyH showed that it was translocated post-translationally, most likely in a folded and active conformation, confirming that AmyH is a substrate of the Tat pathway. We thank Drs. Teresa Pinheiro and Judith Thomas for stimulating discussions, Pete Cain for critical reading of the manuscript, and Mike Dyall-Smith for providing H. hispanica and the plasmid for transposon mutagenesis. This work was supported by a Biotechnology and Biological Sciences Research Council studentship to G.H. and a Royal Society University Research Fellowship to A.B.